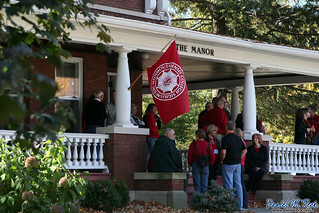 SEPTEMBER 9, 2008 — MONMOUTH, ILL. — Daniel M. Reck has been appointed as the new assistant director of Greek life, leadership, and involvement at Monmouth College in Illinois. The posting was reported by Illinois radio station WGIL and also covered by his undergraduate alma mater, DePauw University. WGIL's report says, "Reck's diverse employment background includes two years as a student life counselor at Ball State University, five years as a chief medical officer with Boy Scouts of America and his ongoing presidency of forzandoArts." Reck recently finished a season as a marching instructor and pep band conductor at Hinsdale Central High School in Illinois, concurrent with his final year of graduate studies at Northwestern University. He earned a Master of Science in Education and Social Policy from that university's School of Education and Social Policy. "I am very pleased to be here at Monmouth College," says Reck, who works closely with the campus' four fraternities and collaborates with Assistant Dean of Students Michelle Merritt in programming for the three sororities. "Dean Merritt is an excellent colleague. The entire staff is very welcoming." While at Monmouth, Reck also hopes to work with the Fighting Scots Marching Band. "It is very unusual for a Division III institution to have a marching band," says Reck, who also directs the Tiger Alumni Bands at DePauw. "There's nothing quite like a pounding drum cadence to electrify a football stadium." In addition to working with the campus' fraternal organizations, Reck will also collaborate with the student government and advise the Alternative Spring Break program, which gives students the opportunity to travel throughout the country performing community service instead of vacationing during spring break.